This family owned, sit-down Mexican restaurant and bar is known for its loud, happy atmosphere. Order a margarita in strawberry, raspberry, mango, peach, banana, tamarindo, or regular – happy hour runs all day Monday and Tuesday. If you're a beer drinker, they have two specialty choices and six on tap. Party room available, and 99-cent margaritas on Mondays and Tuesdays. A classic Mexican restaurant featuring a south-of-the-border atmosphere and all your favorite dishes including fajitas, chimichangas, and more. 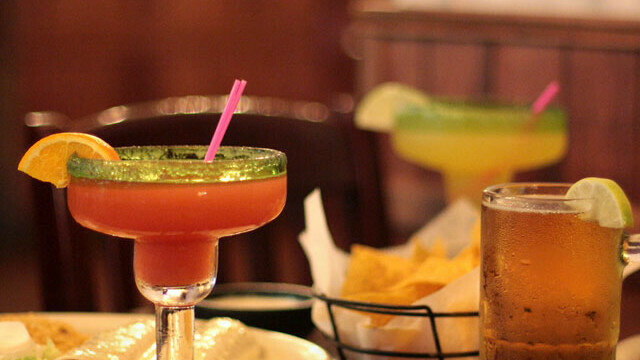 Try their margaritas or their highly popular cheese dip. Vegetarian friendly, private party room. On Sundays, one child for each adult may eat for free. Party room available. $0.99 margaritas on Mondays and Tuesdays.